In this week's post, we want to share with you some of the best 3D-printed models of the spine uploaded by embodi3D® members. We will explore features of this unique anatomy and some of the main uses of 3D printing as it relates to the spine . To convert your own scans and download and 3D-print STL files from other users, all you have to do is register with embodi3D®. It's quick, easy, and costs absolutely nothing to join. Anatomical models have applications in clinical training and surgical planning as well as in medical imaging research. The Wall Street Journal recently ran an article to discuss the many ways 3D printing is changing the face of healthcare. The article also highlighted a case where a 3D model of a pelvis was used to plan a surgical operation on a young female patient. A full-scale, anatomical model of a human lumbar vertebra created with embodi3D®. In terms of clinical applications, the physical interaction with models facilitates learning anatomy and how different structures interact spatially in the body. Simulation-based training with anatomical models reduces the risks of surgical interventions, which are directly linked to patient experience and healthcare costs. 3D printing (3DP) is most frequently utilised in spinal surgery in the pre-operative planning stage. A full-scale, stereoscopic understanding of the pathology allows for more detailed planning and simulation of the procedure. Assessing complex pathologies on a model overcomes many of the issues associated with traditional 3D imaging, such as the lack of realistic anatomical representation and the associated complexity of computer-related skills and techniques. 1999 D’Urso et al. (5) Craniofacial, maxillofacial and skull base cervical spine pathologies. 2005 D’Urso et al. (6) Complex spinal disorders. 2007 Guarino et al. (7) Multiplane spinal and pelvic deformities. 2007 Izatt et al. (8) Deformities, spinal tumours. 2007 Paiva et al. (9) Cervical Ewing Sarcoma. 2008 Mizutani et al. (10)Rheumatoid cervical spine. 2009 Madrazo et al. (11)Degenerative cervical disease. 2010 Mao et al. (12) Kyphoscoliosis, congenital malformations, neuromuscular disease. 2010 Yang et al. (13) Kyphoscoliosis. 2011 Wu et al. (14) Severe congenital scoliosis. 2013 Toyoda et al. (15) Atlantoaxial subluxation. 2014 Yang et al. (16) Atlantoaxial instability. 2015 Li et al. (17) Revision lumbar discectomy. 2015 Kim et al. (18)Thoracic tumours. 2015 Sugimoto et al. (19) Congenital kyphosis. 2015 Yang et al. (20) Adolescent idiopathic scoliosis. 2016 Goel et al. (21) Craniovertebral junction anomalies. 2016 Wang et al. (22) Congenital scoliosis, atlas neoplasm, atlantoaxial dislocation. 2016 Xiao et al. (23) Cervical bone tumours. 2017 Guo et al. (24) Cervical spine diseases. An anatomically accurate full-size human lumbar vertebra created from a real CT scan. The lumbar vertebral bodies are large, wide and thick, and lack a transverse foramen or costal articular facets. The pedicles are strong and directed posteriorly. The superior articular processes are directed dorsomedially and almost face each other. The inferior articular processes are directed anteriorly and laterally. A 3D printable STL file and medical model of the lumbar spine was generated from real CT scan data and is thus anatomically accurate as it comes from a real person. It shows the detailed anatomy of the lumbar (lower back) spine, including the vertebral bodies, facets, neural foramina and spinous proceses. Another well reported benefit of 3DP models is improved patient education. A physical model is much easier for a patient to understand than complex MRI and CT scans. A Whole Spine (Dorsal-Lumbar-Sacral) and Aorta NRRD file from CT Scan for Medical 3D Printing As 3DP technology continues to become cheaper, faster and more accurate, its use in the setting of spinal surgery is likely to become routine, and in a greater number of procedures. 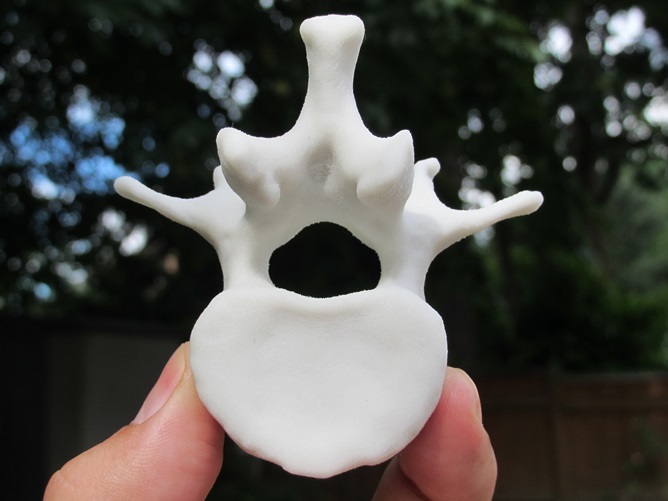 A 3D printable STL file contains a model of the thoracic spine derived from a CT. The spine has significant scoliosis. In a recent embodi3D® article, we touched on the topic of how medical 3D printing is being used to plan spinal surgeries, such as in correcting the spinal curvature in scoliosis patients. Scoliosis is considered to be present when there is a coronal plane curvature of the spine measuring at least 10°. However, treatment is not generally instituted unless the curvature is > 20-25°. The curvature may be balanced (returning to midline) or unbalanced. The vertebrae at the ends of the curve are designated the terminal (or end) vertebrae, while the apical vertebra is at the curve apex. Curvatures are described by the side to which they deviate. A dextroscoliosis is convex to the right, with its apex to the right of midline. A levoscoliosis is convex to the left, with its apex to the left of midline. primary and secondary (compensatory), but it is often difficult to make the distinction and so these designations are no longer commonly used. Scoliosis is almost always associated with abnormal curvature in the sagittal plane. The most common finding is loss of normal thoracic kyphosis. The Cobb method can be used to determine sagittal plane deformity. Rotational deformity is often present but can only be grossly assessed on radiographs. It can be measured on CT scan by superimposing the apical and terminal vertebrae. Normally, the T1 vertebra is centered over the L5 vertebra in both the coronal and sagittal planes. Coronal or sagittal plane imbalance can be measured as the horizontal distance between the center of the L5 vertebral body and a plumb line drawn through the center of the T1 vertebral body. An excellent tutorial of A Ridiculously Easily Way to Convert CT Scans to 3D Printable Bone STL Models for Free in Minutes which allows you to follow along with the tutorial. Included is an anonymized chest abdomen pelvis CT in both DICOM and NRRD formats. disc may herniate. A bulge is often a normal variant, particularly in children in whom all normal discs appear to extend slightly beyond the vertebral body margin. Bulge may also be associated with disc degeneration or may occur as a response to axial loading or angular motion with ligamentous laxity. Occasionally, a bulge in 1 plane is really a central subligamentous disc herniation in another plane. Asymmetric bulging of disc tissue greater than 25% of the disc circumference may be seen as an adaptation to adjacent deformity, and is not considered a form of herniation. Herniations are a localized displacement of disc material beyond the limits of the intervertebral disc space in any direction. A 3D model of a severe scoliosis. CT scan should always be performed with reformatted images. Angled reformatted images and 3D reformations are often useful in assessment of severe curvatures. Some physicians find it useful to obtain both SPECT and CT images of degenerative scoliosis. An area of arthritis on CT scan, which shows increased uptake on SPECT, is probably a pain generator. MR can be difficult to interpret when scoliosis is severe. Angled axial images should be obtained based on both sagittal and coronal scout images and angled along the plane of the vertebral endplate on both scouts. Sagittal images should be angled along each segment of the curvature. The coronal plane is often the most useful for evaluating bony anomalies, spondylolysis, or degeneration of the discs and facet joints. 1. Bücking, T. M., Hill, E. R., Robertson, J. L., Maneas, E., Plumb, A. A., & Nikitichev, D. I. (2017). From medical imaging data to 3D printed anatomical models. PloS one, 12(5), e0178540. 2. Wilcox, B., Mobbs, R. J., Wu, A. M., & Phan, K. (2017). Systematic review of 3D printing in spinal surgery: the current state of play. Journal of Spine Surgery, 3(3), 433. 3. Ross, J. S., Moore, K. R., Bryson Borg, M. D., Julia Crim, M. D., & Shah, L. M. (2010). Diagnostic imaging: spine: published by Amirsys®. Lippincott Williams & Wilkins, Baltimore. 4. D'Urso PS, Askin G, Earwaker JS, et al. Spinal biomodeling.Spine (Phila Pa 1976) 1999;24:1247-51. 10.1097/00007632-199906150-00013. 15. Yang JC, Ma XY, Xia H, et al. Clinical application of computer-aided design-rapid prototyping in C1-C2 operation techniques for complex atlantoaxial instability. J Spinal Disord Tech 2014;27:E143-50. 18. Sugimoto Y, Tanaka M, Nakahara R, et al. Surgical treatment for congenital kyphosis correction using both spinal navigation and a 3-dimensional model. Acta Med Okayama 2012;66:499-502.